Debris flows involving ash-fall pyroclastic soils, which mantle slopes in the mountain ranges around the Somma-Vesuvius, represent a relevant societal risk. 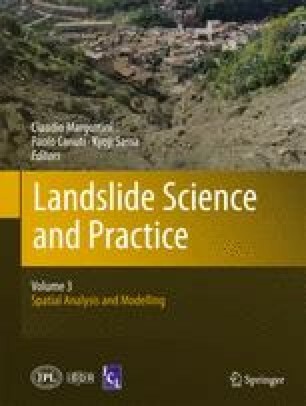 In the last years, many methods were applied to evaluate susceptibility and mobility of these landslides, considering at least two fundamental parameters: the slope angle and the thickness of the pyroclastic mantle. Despite this understanding, the assessment of soil thickness along slopes is still a challenging issue due to its high spatial variability and the steep morphological conditions that limit the use of traditional exploration methods. To overcome this problem, heuristic geomorphological methods were mostly applied up to now. In this paper, a regional-scale model of the ash-fall pyroclastic soils distribution along slopes is proposed, considering the isopach maps of each principal eruption. By means of field surveys, the model was validated and an inverse relationship between thickness and slope angle was found. This research was supported by the PRIN Project (2007) “Analysis and susceptibility and hazard zoning for landslides triggered by extreme events (rainfalll and earthquake)” funded by the Ministry for Education, University and Research (MIUR-Italy).